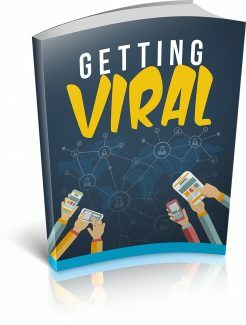 Over the next few pages, we’re going to take a look at each of these elements, and examine how you can use them to design and launch your own viral campaign. Don't worry. It's not as complicated as it looks! For example, if you build and sell a software package that helps bloggers find free photos for use on their blog, you could offer a free version of the software that only searches one database instead of several. Or if you've written an ebook, you might release one chapter for free. One thing to remember, though, is that the free product must be useful all by itself. You're not releasing a free trial, you're essentially building two products. One which you'll give away and one which you will sell, and they both need to be valuable to your users. Free software that is so limited as to be worthless is not a good candidate for a viral campaign. The same is true for a chapter of an ebook that ends with a question. Some marketers pull just this sort of trick to "force" customers to upgrade, but very often it will backfire. Customers are savvy, and they dislike being manipulated this way, so don't make the mistake of thinking you'll lose sales by giving away too much information, because the opposite is actually true. You'll gain sales by giving away great stuff. Especially if your great stuff is easy for your users to share among their friends, family, and colleagues. The second element of a fantastic viral marketing campaign is the ability of your customers to share your product with their peers. Think about the hundreds of email forwards you get in a year. That's because people love to share great stuff. Good marketers know this and take advantage of it by providing their customers with what they want, and then they sit back and watch it spread. Viral campaigns thrive on the Internet largely because of the social networks that exist. Ten years ago marketers had to rely on telephones and email (maybe) to get the word out about a new product or a great service. You can imagine the results were unpredictable and slow to materialize. Today, we have dozens – maybe even hundreds – of social networks to use to get our message to the masses. But for some, that means having the opposite problem: where do you start? For an online marketer, the first place to start is with your very own email list. These are the people who already know you, like you, and buy from you. They're your biggest fans, and they're the ones who are most likely to pass your great products on to their family and friends and social network. So make sure you're keeping them informed about the latest products you're developing, any contests you're holding, or any other thing that's going on that they might want to share. You probably have an account with several of the more popular social networking sites, like Facebook and Twitter. But for viral marketing to work in these venues, you have to be hanging out with the right crowd. If you use Facebook primarily for friend and family interaction, trying to launch a viral campaign there is probably not a good move. The same goes for Twitter and Google Plus. Do you follow those in your niche, or those who are other marketers? If it's the latter, your niche campaign won't have very good results here either. Instead, make an effort to follow those who share your passion for your niche, instead of those who are simply marketing their own online business. Now if your niche is internet marketing, then you should be following other marketers, but that's the only exception. Concentrate on following – and being followed by – those who are in your niche, but who are not necessarily selling in your niche. In other words, you want to be hanging out with the buyers, not the sellers. For strictly social interaction, Google Plus, Facebook and Twitter are your number one choices. If your target market is other business owners, though – say for example you sell a product aimed at accountants – you need to get on LinkedIn. If you're not familiar with it, LinkedIn is basically a database of business professionals in all areas of expertise. It's similar to Facebook, but without the games and other social activities. LinkedIn allows you to network with other professionals in your area of expertise, form groups, organize meetings, and develop a vast network of colleagues you can reach out to through private messaging or by posting status updates. You can automate your LinkedIn updates just like you can with Facebook and Twitter, and even link your other social network accounts so everything is up to date. If your product is geared toward professionals, LinkedIn is the social network of choice. For viral campaigns built around funny videos, great photography, comic strips, or other visual media, StumbleUpon is the social network of choice. A combination of a social application and a bookmarking service, StumbleUpon is where you go when you're looking for new stuff on the Internet. Just click the button on your toolbar, and you'll be transported to the next interesting thing as determined by the choices you made when you signed up. Like animals? StumbleUpon will serve up a random cat video or heartwarming dog story. Into sports? You might land on a video of Tiger Woods hitting a hole in one, or an ad for a new kind of practice ball. Of course, getting your content to go viral on a social network involves more than just putting it out there and hoping for the best. Later on we'll discuss how you can give your campaign a virtual push to get it started, but for now, just be aware of the options available in the social networking world. Each has its own purpose and followers, so pay attention to where your customers hang out to determine the best social networks for your needs. Leveraging the power of your own network is an important aspect of any successful viral campaign. Chances are some of your friends are marketers just like yourself, and chances are they've got mailing lists, blogs, and Twitter followers in related, complementary niches. These are powerful assets you can use when it comes to launching a viral campaign.